The Dark Ranger: The Dark Ranger Is Not Alone! Sometimes (ok, more than sometimes) I wonder if the NHL has a clue what it is doing. The latest breaking story is that the NHL is threatening the New York Rangers owners (Madison Square Garden, MSG) with possible expulsion from the league for accusing the league of violating antitrust laws. 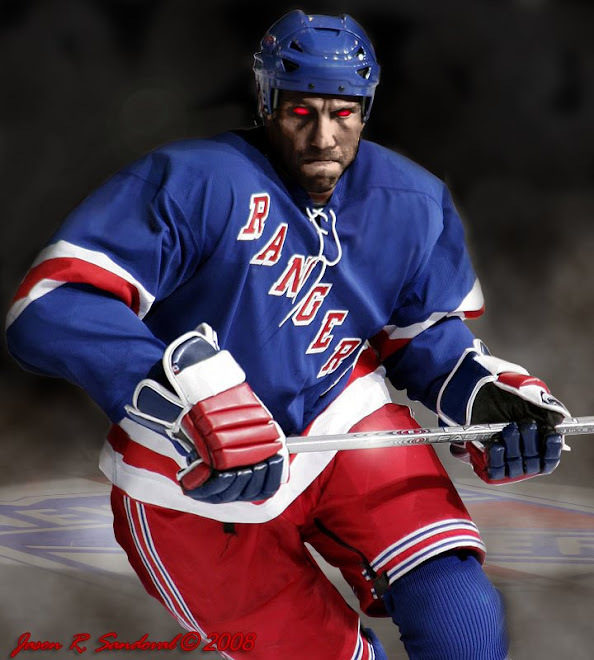 The background is that the Rangers sued the NHL claiming that the NHL had no right to take control of the Rangers website and other marketing and promotion programs. Last year a judge agreed with the NHL and said the NHL was well within its rights to take control of the rangers website. 1. MSG is one of the best owners the NHL could possibly have and in a time when good law abiding owners are seemingly very hard to find (see NY Islanders, Buffalo Sabres, and recently Nashville Predators), it seems very counter productive to be booting out one of the best and most stable owners around. Not only is MSG stable, but they are one of the biggest media outlets in New York and even across the United States. For a league that is starving for hockey coverage in the United States, booting out one of your better owners and media partners seems counter productive too. 2. It seems like this is just further evidence of a Bettman cartel in the NHL where Bettman will do everything he can to get pro-Bettman owners in the league (see Williams ”Boots” Del Baggio) and do everything possible to keep independent minded owners out of the league (see Jim Balsillie). With this action the NHL is trying to send a statement to all other owners in the NHL: “Do what we want or you’ll be gone”. I am no lawyer but it seems to me that this must break some sort of anti-trust laws. So far Bettman has been successful in keeping tight control over the NHL and silencing those who might want to challenge him and his rule. One has to wonder if and when this might come back to bite him in the foot. Challenging a media giant like MSG with expulsion is a bigger battle than he has undertaken in the past and one wonders when he will have bitten off more than he can chew. Now that the players get a fixed share of revenue I expect the NHLPA is going to want to have a say in matters like this since such moves will potentially affect league revenues. If MSG, Balsillie, NHLPA and possibly other big market owners choose to fight back it could be wildly lopsided fight that Bettman and his cronies are sure to lose. It will be interesting to see how this will unfold. THE DARK RANGER says: the draft tonight will be special. 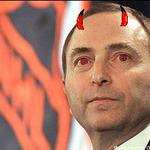 Every time Bettman speaks, the crowds will 'BOO' him. No one likes a bully. At the very least, this counter-lawsuit will keep talk at an all-time high regarding the NHL -- and you know the Dolans are going to strike back in a big way over the next couple of weeks. Thank the hockey Gods that we can finally now talk about something other than Sean Avery's speedo and Vogue internship. Speaking of which, it looks like Sean Avery is actively discussing a return to his LA Kings -- who in rumor accounts- will provide him with the $4 million per year he is seeking from the Rangers. Glen Sather has publicly stated he has no intentions of talking to Avery before July 1 and his offer is in Avery's agent's hands. Otherwise, no deal. It has been mentioned that Avery was potentially contemplating a move over to the Island of Ted Nolen -- which would be terrific in reinvigorating the rivalry between the NY Rangers and Islanders. Not since Dennis Potvin would we have seen such hatred in an ex-Ranger. Fun stuff ahead. Tonight the draft. In two weeks, free agency. Yee haw.